The last decade has seen many war documentaries filmed by embedded cameras in places like Iraq and Afghanistan. So the latest one, Tell Spring Not to Come This Year, risks falling into obscurity before it even releases. Luckily it carries a distinction that makes it somewhat promising: it follows the U.S.-trained Afghan army left in power after the Americans started to leave (it was filmed in late 2014). A scene in the middle of the film shows soldiers arriving at an abandoned Coalition camp, with Danish, British, and American flags. The Afghanis note that nothing of use has been left. Only things like American t-shirts and bumper stickers (“God Bless Our Troops Especially Our Snipers”) remain. Unfortunately, the overriding sense that I get from Tell Spring Not to Come This Year, is that the Afghan army is badly trained and badly led. Like Haemoo, a fiction film showing at the Denver Film Festival, Tell Spring Not to Come This Year is a movie without a hero. Nobody is likeable and smart. 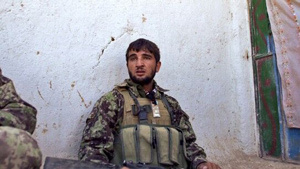 Some of the grunts deserve our sympathy, but none of them offer much hope for the Afghan army. One of our protagonists is introduced while boxing. He says he wanted to study literature, but flunked out. He was unemployed for a couple of years before finally signing up with the army... presumably the only employer who was hiring. Another protagonist says he never liked school. He’s now an officer. Eventually, the cameras follow the soldiers out on a mission. But when one finally eplains the mission to the camera, it’s only that “now and then we need to get out there and impose ourselves.” No strategy. No goal. Just get out there and impose. At least the prisoners are treated fairly well. The camera is allowed to interact with a prisoner who seems to be taking it in stride. The lack of motivation is illustrated late in the film. After receiving orders and a pep talk against cowardice, a soldier points out to the commander, “Sir, we are not afraid, but we have not been paid our salary for 9 months.” The answer: shut up and focus on your mission. Tell Spring Not to Come This Year suffers from the structure of the interviews. Verbal interviews are played over footage of daily life. We never know who is speaking, nor can we be sure that the spoken words match the image we’re watching. There are also measured gaps between statements on the soundtrack, and that makes the film feel slow. I’m not saying I’d rather see talking heads, but at least a talking head speaks at a normal human pace. The film couldn’t have known that, just last month, President Obama would change his mind and extend the U.S. occupation for at least another year. But it’s hard to see how 5,500 Americans, spread over the entire country, could make a dent in the depressing problems of Afghanistan. If you’re looking for some sort of hopeful conclusion, you might find some solace in that the locals will once again be in charge of their own army. But the previous 90 minutes have shown that the Army is badly run and that Afghanistan is practically ungovernable. I don’t think the filmmakers set out to tell such a hopeless tale, but read between the lines and it seems like that’s all they got.